SALT LAKE CITY — Powerblanket® engineers and manufactures custom products in as little as 14 days to protect products from freezing and to maintain a constant temperature. Powerblanket® Custom blankets carry a safety certification for hazardous locations (CID2 T4) and UL/CSA/CE. These safety certifications enable Powerblanket® to handle almost every heating need. GreenHeat® Technology is a revolutionary heat spreading system that is designed to provide a highly efficient and uniform distribution of heat while only consuming low levels of energy. 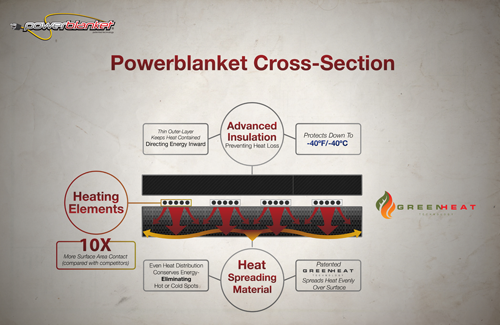 For more information about custom heating solutions, visit powerblanket.com/custom. [email protected], or visit the company’s website at powerblanket.com. SALT LAKE CITY – The Powerblanket® line of drum and bucket warmers replaces conventional brand heaters, warming ovens and blowers for heating temperature-sensitive materials such as plastic, metal and other containers. Utilizing patented technology, the heaters are a much more energy (and cost) efficient solution for maintaining viscosity and flow for stored liquids, including water, chemicals, paint and food products. Powerblanket patented technology is a revolutionary heat spreading system designed to provide a highly efficient and uniform distribution of heat while only consuming low levels of energy. The technology allows containers to be rapidly and consistently warmed without creating the hot and cold spots common with competitive products. Powerblanket® bucket heater and drum warmers provide maximum freeze protection to protect the product by maintaining a desired temperature through an evenly heated area. Not only do they reduce downtime, but the warmers also prevent product waste by evenly maintaining temperatures. The insulated full-wrap design keeps heat in and cold out, working on both metal and poly drums and pails year round. Powerblanket® warmers operate from a standard 120-volt electrical source, and are are certified to UL/CSA/CE standards. The product line fits 55, 30, and 15-gallon drums and 5-gallon buckets and offer a PRO model that comes with an adjustable thermostatic controller that allows customers to set and manage material temperatures from ambient up to 160°F / 71°C (± 2°F / 1°C). The Rapid Ramp model includes an adjustable temperature control and Rapid-Ramp heat technology, which will quickly heat and keep your materials at a temperature of 100°F / 38°C (± 10°F / 6°C). These units use full amps to reach temperature then “ramp” down to about half of the current to maintain that temperature. Powerblanket® provides superior heating solutions for a multitude of applications, including industrial and manufacturing temperature control, ground thawing, concrete curing and many more. For more information, contact Powerblanket®, 1997 South 5070 West, Salt Lake City, UT 84104, call 877.398.7407 in the U.S. or 403.262.5770 in Canada, fax 866.245.9483, send an e- mail to [email protected], or visit the company’s website at powerblanket.com.